to mark the return of over a hundred polished whale tooth, known as a tabua. Geneva/Nadi, 29 May 2017: Today the Hon. Prime Minister of the Republic of Fiji Rear Admiral J.V. 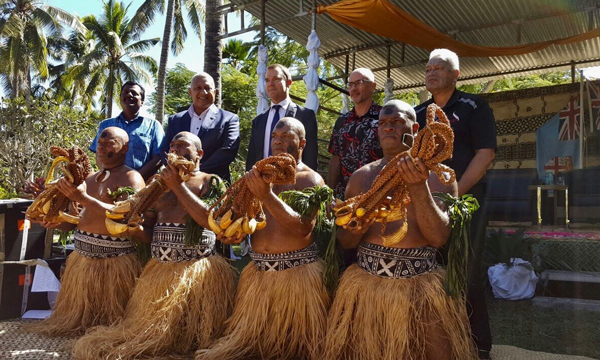 Bainimarama was joined by CITES Secretary-General John Scanlon, in a culturally significant event held in Nadi, Fiji to mark the repatriation of over a hundred tabua, the polished tooth of the CITES-listed sperm whale, that were seized by New Zealand’s authorities. This high-level ceremony marks the start of two weeks of events around the world, stretching from the Atlantic to the Pacific Oceans, in which CITES is supporting the world’s oceans. “Today in Nadi, we see culture, people and wildlife come together in a way that stirs our emotions and sense of common purpose. It sends a powerful message not only here in the Pacific but worldwide of the strong links between culture, people and wildlife, which serves to enrich the debate about the conservation and sustainable use of wildlife. We applaud the efforts of the CITES Management Authorities of Fiji and New Zealand to deal with these issues fully in accordance with CITES and in such a culturally sensitive manner.” said CITES Secretary-General John Scanlon. At the ceremony, the Secretary General also noted that this year marks the 20th anniversary of Fiji joining CITES and expressed his warm thanks and congratulations to Fiji, including for its successful sponsorship of the proposal to list the mobula, or devil, ray under CITES at CoP17. The handover ceremony was immediately followed by a CITES regional training workshop for 16 countries from the Oceania region, as well as representatives from INTERPOL, SPREP and academic institutions and non-governmental organisations. The Hon.Osea Naiqamu, Minister of Forests and CITES Secretary-General John Scanlon opened the meeting. Mr. Scanlon thanked the the Government and people of Fiji for hosting the meeting and for their warm hospitality and the Government of New Zealand via its Ministry of Foreign Affairs for sponsoring the workshop, which will focus on implementing CITES CoP17 outcomes as well as combating illegal wildlife trade. The workshop will be facilitated by staff of the CITES Secretariat. CITES staff will support the United Nations Oceans Conference being held in New York from 5 to 9 June. As enshrined in its voluntary commitment to the UN Oceans Conference, to be co-chaired by Fiji and Sweden, CITES is committed to “working for sustainable fisheries by delivering on needs-driven capacity building” and the CITES staff at the Oceans Conference will highlight past and future capacity building work of the CITES Secretariat and its partners in its side event on “Recovery of fisheries through cooperation on threatened species and implementation of trade measures”. 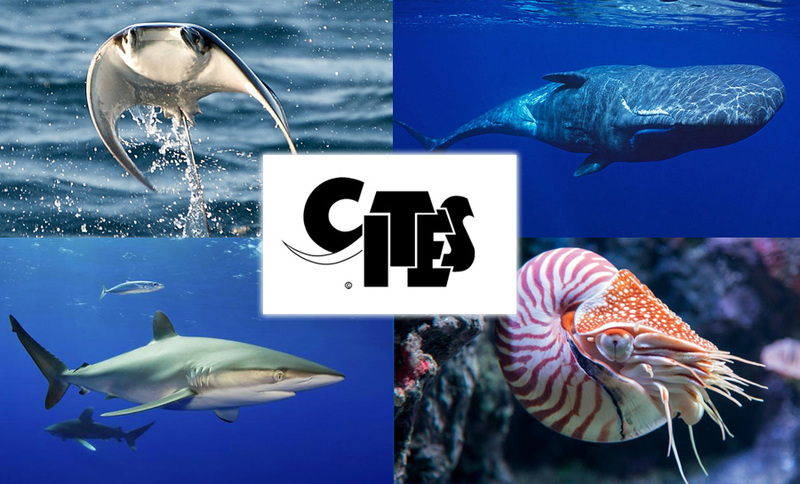 CITES has a long history of regulating international trade in many marine species to help ensure their survival in the wild, including clams, corals, dolphins, marine turtles, sea horses, the queen conch and whales. CITES CoP16 held in Bangkok in 2013 saw the inclusion of the porbeagle and oceanic whitetip shark, as well as three species of hammerhead sharks and all manta rays, and CoP17 saw the silky and thresher sharks, devil rays and the nautilus added to the CITES trade controls regime. Parties at the meeting also adopted an unprecedented number of decisions on marine species, calling for studies and other actions to be implemented before its next Conference in Colombo, Sri Lanka in 2019. “The 183 Parties to CITES are increasingly turning to CITES to help ensure sustainability in our Oceans, and in doing so to support the achievement of UN Sustainable Development Goal 14. Oceania is a key region for us in offering support for the implementation of CITES new listings of sharks and rays and other marine species” added Scanlon. The CITES Secretariat is doing its utmost to assist its Parties, in particular developing countries, to implement the provisions of the Convention for these marine species to ensure that trade is legal, sustainable and traceable. The CITES Secretariat’s efforts, in cooperation with its partners, including the UN FAO, in building capacity to ensure the survival of marine species has also been recognized by the UN General Assembly in its resolution on Sustainable Fisheries. Last week, the European Commission announced a significant financial contribution of 2.25 million EUR to the CITES Secretariat to help with the implementation of decisions adopted at CITES CoP17. This generous EU contribution includes 900,000 EUR earmarked to support the capacity building work of the CITES Secretariat and its partners to assist Parties to implement CITES provisions on commercially exploited CITES-listed marine species. Later this week, the CITES Secretary-General will meet Mr Seve Paeniu, Head of the Oceania Customs Organisation Secretariat and staff to discuss CITES issues and thank them for their front line support in the fight against wildlife trafficking, especially as it affects marine species in the Oceania region. “While we all have a different role to play, we are all striving to achieve the same objective of a heathier ocean – where marine animal and plant species can survive in the wild and be sustainably used by people. At CITES, we will work tirelessly to ensure international trade in CITES-listed marine species is sustainable and to address illegal, unsustainable, and unreported trade”, concluded Scanlon. With 183 Parties (182 countries and the European Union), CITES remains one of the world's most powerful tools for biodiversity conservation through the regulation of trade in wild fauna and flora. Thousands of species are internationally traded and used by people in their daily lives for food, housing, health care, ecotourism, cosmetics or fashion.